Cliftonville trio Martin Donnelly, Ciaran Caldwell and Chris Ramsey have become the latest Premiership players to move to Championship club Larne. Former Cliftonville defender, Paul Finnegan, has also moved to Inver Park after a spell with Longford Town. Other players with Premiership experience have already been snapped up by Larne following an investment in the club by businessman Kenny Bruce. These include former Cliftonville striker David McDaid. The Reds confirmed on Monday night that Donnelly, Caldwell and Ramsey had joined the Championship outfit. 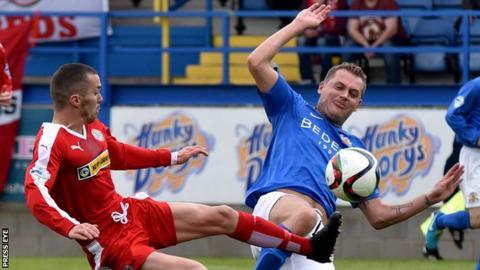 Donnelly, 29, helped Cliftonville clinch two Premiership titles during his six-and-a-half years with the club and also won League Cup and County Antrim Shield medals with the Reds. Former Glenavon and Glentoran player Caldwell made 170 Reds appearances during two spells with the club while Ramsey joined Cliftonville in the summer of 2016. A Cliftonville statement thanked all three players for their service to the club. The players will be available to Larne from the start of January.